It’s that time of year again. Many Americans look forward to the holidays year-round, but that doesn’t reduce the high levels of stress for those who are traveling. The Wednesday before Thanksgiving is historically the busiest travel day of the year as millions take to the roads — and the air — to stuff themselves with turkey alongside family and friends. Don’t expect a reprieve after T-Day, though, as the the same travelers head out of town the Sunday following Thanksgiving. Luckily, not all airports — or flights — are weighted the same. These U.S. airports tend to suffer the most from delayed, cancelled and overbooked flights this holiday season. The good news, however, is that if you’re flying into or out of Europe and find yourself on a delayed, canceled or overbooked flight, you could get some cash back thanks to the little-known law, EC261. O’Hare is frustrating any time of year, in fact, many travel websites and experts will encourage you to avoid O’Hare at all costs. It only gets worse the closer it gets to Turkey Day, so if you can, opt instead to fly out of Midway Airport and book a flight earlier in the day before the terminals start to become congested. If not, you might be one of the millions of passengers who will deal with flight disruptions out of this airport every year. 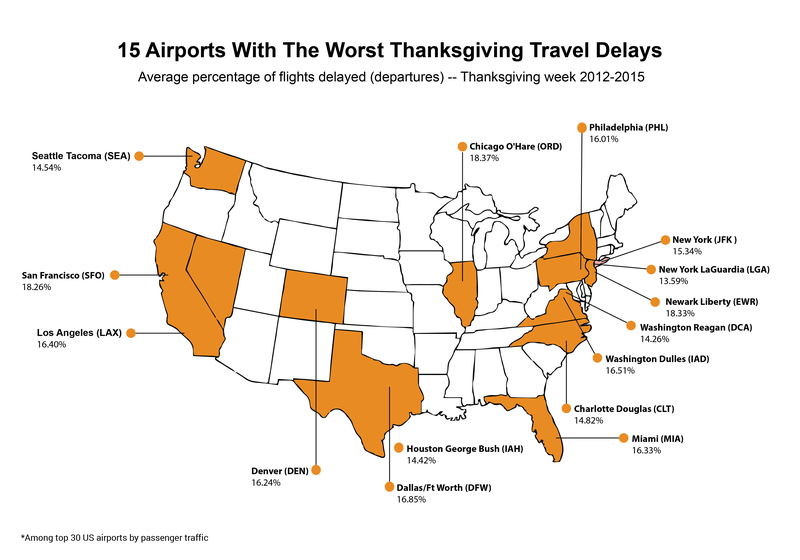 If you think you are avoiding crowds by flying into Newark instead of JFK or LaGuardia this Thanksgiving, think again. Newark might have a reputation for being a lesser-known New York-area airport, but it’s also the busier of the sibling airports during the holidays. If your final destination is New Jersey–not New York–consider Trenton where there tends to be little to no rush during the busy Thanksgiving season. One of the West Coast’s craziest airports, San Francisco International, will be packed this holiday season. It’s Northern California’s largest airport, meaning you will have trouble finding a time where you can fly out without dealing with the madding crowd. Oakland provides a better option for those who dislike standing in security (so, everyone) and is only 20 miles away from the heart of downtown San Francisco. As the departure airport for more than 200 destinations around the globe, Dallas is a nightmare even in the best of times. After Atlanta, it’s by far the biggest–and busiest–airport in the South, making it a popular hub for both domestic and international connections. However, there is hope for those looking to bypass lines and delays. Dallas Love Field is only 17 miles away from DFW and offers flights from some major airlines including Southwest and Delta. All three Washington, D.C., metro-area airports have received criticism and negative feedback from fliers, but Washington Dulles International tops them all. Some of the complaints include an overwhelming number of delays and cancellations, and its location, which is in the suburbs of Virginia and not the city center. Dulles is also under construction to create larger terminals and better parking that could lead to commuter headaches. Consider arriving into or departing out of Reagan National Airport instead. Reagan is in Arlington, Va., but is accessible to all Washingtonians by public transportation. It also boasts a better track record for fewer delays on domestic flights. That relaxed California attitude doesn’t get you very far at LAX. Between the traffic getting to the airport and the long security lines you have to face when there, you almost spend more time preparing for your flight than on it. Fortunately, the Los Angeles metro area has a number of other airports from which to choose if you’re traveling domestically, including Long Beach and Burbank. These airports also offer flights from airlines such as JetBlue, United, Southwest and Delta, so there are plenty of options for avoiding those LAX headaches. If you are looking for a long, bumpy ride, look no further than Miami International. As one of the worst-rated airports in the nation by passengers and one of the busiest as well, Miami leaves a lot to be desired. Fortunately, there are a number of other airports nearby where you can find tickets to and from major cities for similar prices. Check out Fort Lauderdale (FLL), which is only 32 miles way or West Palm Beach (PBI) at 71 miles away to avoid lines, construction and a number of snowbirds clogging up the terminals. Some overbooked flights are eligible for cash back, too. Read more about your rights as a passenger to see which flights qualify or fill in your flight details to see if your flight qualifies. Denver serves as the de facto “Gateway to the West” for many airlines – the West Coast, that is. While most the majority of the year, the airport can boast high marks for its service and punctuality, all bets are off when the Thanksgiving rush starts. As the midpoint for many travelers out west, it’s also one of the most crowded airports in the United States this time of year. You should consider flying into or out of Colorado Springs instead. It’s only about 80 miles away, so depending on your final destination it might be worth it to avoid the throngs of people at DEN. Flight delayed more than three hours? You could be eligible for compensation in certain cases. The “City of Brotherly Love” could use an upgrade. Delays aren’t the only problem passengers tend to face when moving through the terminals in Philly: some of the major complaints include long lines at customs, a lack of cleanliness and long waits for baggage and at the check-in desks. There is some good news if you are considering alternative airports and willing to drive a little in order to reach them. Wilmington New Castle (ILG) is only 24 miles away, and Trenton Mercer (TTN) is just a little bit farther at 36 miles. It’s no surprise that JFK is on the list of terrifying airports during the Thanksgiving holiday. As most New Yorkers know, JFK can be the bane of air travel existence, and it doesn’t get any better for those looking to get out of the city. You might think about heading to LaGuardia instead, but it’s not far behind JFK when it comes to flight delays and cancellations. If you have the time, see if you can head over to MacArthur Airport on Long Island. Though it doesn’t serve as many airlines, it does offer a much easier travel experience. Regardless of the major city or airport, if you are flying into or out of Europe then your delayed, canceled or overbooked flight may be potentially eligible for compensation. Many factors come into play, but a quick eligibility check will give you an idea.